Dave Salyer Gun. I purchased here on the forum. This is the gun I used all summer because of the roll trigger. Nearly matches to a Pardini in roll pull, incredible trigger at 3.5#. The ultra dot is not included nor the thin grips. 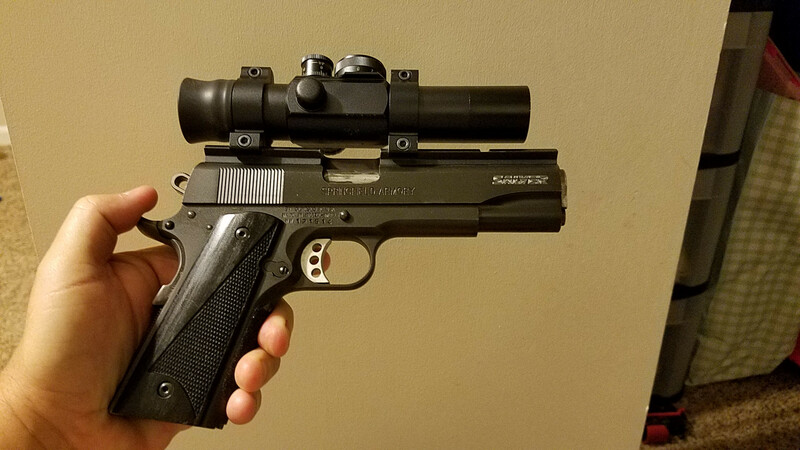 Includes the Springfield standard grip with rail. I will add an ADCO 1" dot if you would like at full price. Please PM me for my phone number and we can work together on delivery. Local in Little Rock, Arkansas but price includes shipping/ffl. Just a quick thank you to Dan, for waiting until I got back to the USA to sell me this gun. Check is in the mail, and the gun is on its way to my FFL. I liked what I saw, Jon approved, and the gun has been used until now for exactly what I want to do with it, practice. Dan meanwhile was building his new gun. I'm sure he'll eventually post photos here.